In Russia, 18 species bred in the presence of breeding records and supervised VNIIK 1 - Russian horse - supervised by TAA. The article analyzes the common factors that affect the current state of horse breeding in Russia. The first Open Championship of Arabian horses of the North Caucasus region. E.Zhukovskaya. Elena E. Zhukovskaya for many years the chief judge of the Pyatigorsk racecourse. She - the author of numerous articles in horse magazines - and dedicated to racing, and general (stories about visiting England, Russian about horses abroad and others.). In this article, she talks about the first championship of Arabian horses. The fact that the Arab, as well as the Akhal-Teke breed, bred not only for racing but also for special shows, where their beauty experts estimate. But, if the exhibition is held in the Akhal-Teke brood Pyatigorsk 11 years in the framework of the International rally enthusiasts of this breed, the exquisite arabchata undeservedly forgotten in the center of the Russian Arabian horse breeding. The first championship and the show went on Arab horse shows in Moscow and St. Petersburg, they are now caught up and Pyatigorsk. (Especially for "Gippomnii"). Trip Report for the purpose of peer review calves aged 1 and 2 years. Author A. Nikolaev, st. n. p. VNIIK. 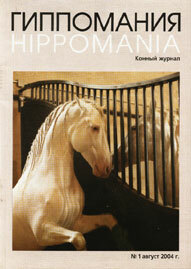 In recent successes Budyonny horses in the sport - in Russia (Knight, cutter, etc..) And abroad (Golden Joe, and others. ), Participation in exhibitions and Budennys magnificent "gold" the good-natured giants Dons break the prejudice the public against these equestrian horses. More and more buyers and fans attracted to the horse capital among the public and abroad. This article - the story of the journey of the expert committee of researchers at the horse plant in which these breeds are bred horses: they. Kirov them. Budyonny, "Steppe", "Don" Zimovnikovsky, the First Cavalry Army.